It was a warm summer day when Dan drove down winding roads to take me to meet his grandparents for the first time. I was nervous. Meeting Dan’s parents hadn’t been to nerve-wracking because we had grown up attending the same church and I had known who they were for most of my life, but I had never met Dan’s grandparents before. What if they didn’t like me? The only thing I really knew about them was that Dan’s “Gramma” was the biggest University of Michigan football fan ever. Once when Dan was little, Gramma Dexter’s…enthusiasm…during a televised football game had scared Dan enough to make him cry. I wasn’t sure what to expect from this visit. I was planning to attend the University of Michigan myself, so at least I had that going for me. Dan called ahead to let Gramma and Grampa know we were on our way. I could hear Grampa’s voice through the cell phone as Dan told them he was bringing his friend to meet them, the one they had heard all about. “Heh? So we finally get to meet Susie?” Grampa asked. He was teasing, but for several months he continued to refer to me as Susie. We pulled up to the house at last and a short, smiley lady welcomed us into her home. I needn’t have worried about Gramma and Grampa not liking me. They welcomed me in like family. Grampa gifted me with a small stained-glass University of Michigan ornament that he had made himself. “You made this?” I asked in surprise. He pointed out the light above the kitchen island. The stained glass light fixture was also blue and maize. “Gramma saw one of these lights in a store and wanted it. I looked at the price tag and said, ‘I could make that'”. So he did. Dan and I were treated to an impromptu dinner of steak and potatoes and I felt right at home sitting at that island and watching blue and maize candles burn in their centerpiece as we chatted with Dan’s grandparents. Time flew by and all-to-soon, it was time to leave. 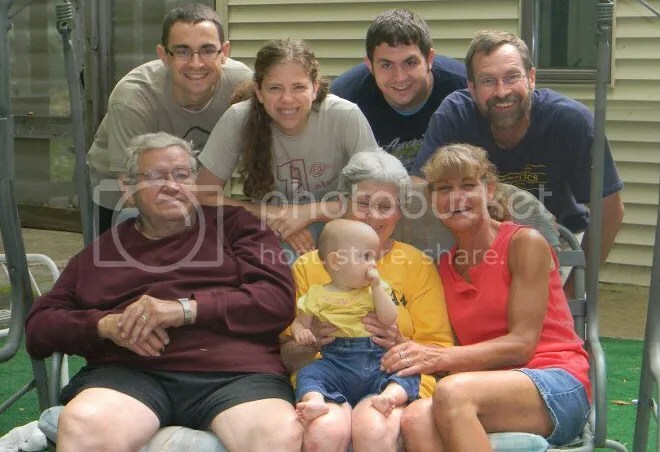 We enjoyed several more visits to Gramma and Grampa over the years as Dan and I went from being friends, to dating, engaged, and married, eventually bringing the great-grandkids for visits whenever we were in the area. But I will never forget that first visit when even Grampa’s teasing made me feel like family and the months that followed when he would always call me Susie. I’d trade it for a finer one, that would not pass away. Tis such sweet peace to know the Lord still lives in this old house. And peace has reigned since he’s been walking up and down these halls. It’s such a joy to know the Lord still lives in this old house. To me a home away from home, is all it really is. Is after all these years the Lord still lives in this old house. And there were times and days I knew it took God’s amazing grace to stay. Cause after all these years the Lord still lives in this old house. Is after all the years the Lord still lives in this old house. After all these years the Lord … Still lives in this old house. Grampa passed away two weeks ago. 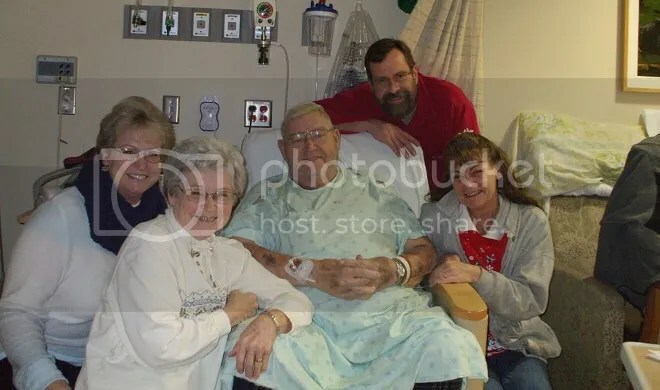 In the time I have known him, Grampa has spent many weeks in the hospital. He always came home again. That’s just how it was with Grampa. He kept fighting and kept working as long as he could. Dan and I used to have a small reclining couch that was given to us from Gramma and Grampa’s house. More than once I cried in Dan’s arms, curled up on that couch, thinking for sure this visit to the hospital would be Grampa’s last. Many times I wondered if he would make it to our wedding, or until we had our baby, or until that baby came home from the NICU, or until he could meet his tiny grandchild. But every other time Grampa recovered and made it home again. He kept loving us, teasing us, and remaining cheerful through a lot of pain and difficulty. Grampa would often connect with our little ones because they all had to be hooked up to wires, poked and prodded, and needed help breathing. It’s true, Grampa’s loud voice scared both Lydia and Abby the first time they each met him, but once they were placed on his chest they curled up snug and happy. One of the saddest parts for Dan and I in saying goodbye to Grampa now is that he never got to meet Paul. We only pray that Paul will also come to love Jesus so that he can meet Grampa in heaven. There’s a part of me that doesn’t want to end this post because it feels like another goodbye. 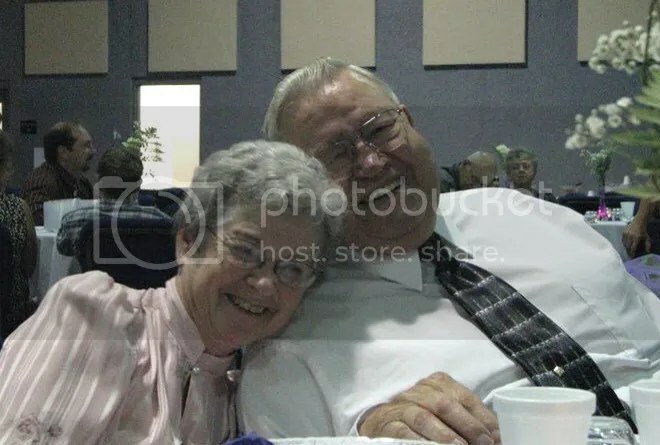 Day-to-day, Dan and I don’t feel the depth of the loss because we didn’t see Grampa that often, but at moments the reality sinks in and it’s just so hard to believe he’s gone. 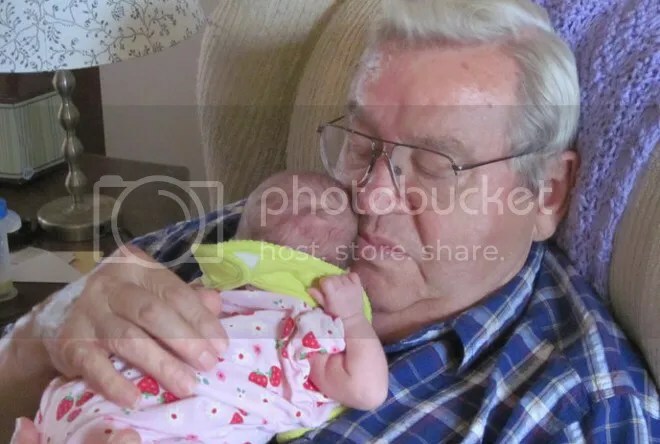 Only Lydia has been able to fully appreciate the victory in Grampa’s death as she has reminded us a number of times, “He’s in heaven with Jesus”. Grampa’s hope for eternity was in Jesus. He arranged his funeral to be reminder after reminder of the hope he had in Christ and the message that was shared was indeed the Gospel. We all will die someday and we will have to account for our actions on this earth. The only hope of heaven is because Jesus died on the cross. Although he was buried, he rose again and offers enteral life to all who will repent and believe in him. The Lord no longer lives in Grampa’s “old house”, but Grampa has gone up to live in a new heavenly mansion. Grampa, if you could read this now, I’d want to thank you for welcoming me into your family. Thank you for teasing me and calling me Susie, for encouraging me when I was hurt, for making me laugh sometimes when I was crying. Thank you for loving us so much, for loving Lydia and Abigail and Paul, even though you never got to meet him. Thank you for singing for me before your funeral. Thank you for keeping your youthfulness and sense of humor even when you were suffering far more than you ever let on. Thank you for loving Jesus and for not being afraid to die. We love you and we miss you. Until eternity. 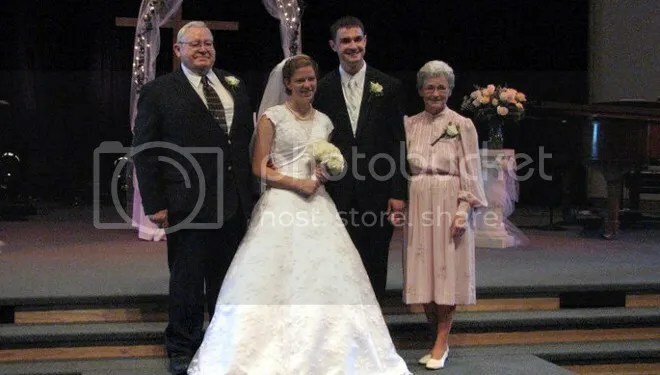 This entry was posted in Sweet Family Memories and tagged goodbye, Gospel, grandfather, grandpa, heaven, hope, Love by justeeni. Bookmark the permalink. A most beautiful tribute to Grampa….no words can tell how deeply it touched me. How he loved his family! Thank you so much, Justine. Love you….and hope you know how much this means to me. Really beautiful, Justine. Brought tears, but like you said, the sorrow is for those of us who are left here.